I just heard a clip on NPR of a woman at an evangelical Christian political rally in Florida. Apparently she has a "make-over ministry" which helps women "be beautiful on the inside and out...and be SUPER MODELS FOR CHRIST"
Please tell me it ain't true. That's how come Jesus was able to feed 5,000 with only two loaves and five fishes. hmmm... perhaps she thought that since Jesus did an extreme makeover on the lepers that she could try something similar.... seriously delusional! Ha! Who would want her in charge of makeup? Egads. I can't think up anything more clever to say than "ugh." 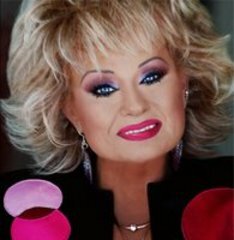 I wonder how many commenting here remember Tammy Faye. Her makeup isn't the only tragedy in her life. I sure remember Tammy Faye, and yes, there is more to her than her makeup! However I think I oughtta find this new makeover minister and give her a REAL challenge. I can see the headlines now: Overweight, hunchbacked, 55 year old dyke becomes SUPERMODEL FOR CHRIST!!! This could be fun. Why on EARTH do they all end up looking the same? Tammy Faye, Jan Crouch, etc. Ewww! I took my pre-teen daughter to see CCM chick band Point of Grace a couple years ago. There, they promoted their upcoming summer camp-type thing, where girls could attend various workshops related to self-esteem, body image, and fashion & makeup strategies. Peace Bang - who gives beauty and fashion tips for women clergy is going to be on Nightline tonight. Peace Bang is very funny and not at all like a plastic pastor.